Ben graduated from the University of Tennessee in 1984. Current day time job is Vice President of Sales for Brenntag Global Marketing. Ben started coaching in 1999 at Wills Park. While coaching at Wills Park Ben was also Deputy Travel Commissioner for 3 years and President of the Wills Park Youth Baseball Association for another 4 years. 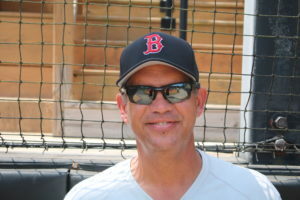 Ben has been coaching travel baseball the past 15 years and coached the Wills Park Yellow Jackets from ages 10-14 then became involved with the Team Georgia Baseball Academy coaching age groups from 13-16. In 2015 Ben became a coach in the Georgia Bombers program and just completed his first season coaching the 15U Bombers with Cody White. Ben has been married to his wife Jill for 31 years and they have 3 Children (Tate 25 who also is an assistant on the 15U Bombers, Bo 23 a recent graduate of UGA and Peyton 20 a Jr. at Ole Miss).